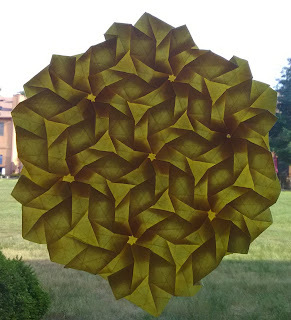 Here is a miniature version of the classic origami spread hex tessellation. 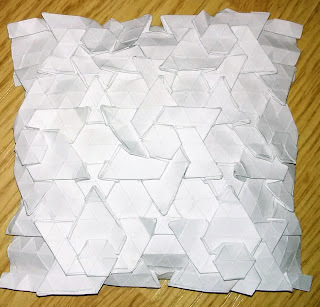 I began with a fairly small square of paper and folded the traditional triangle grid on it with 32 pleats. The square was derived from a standard 8.5 x 11 piece of printer paper. That was trimmed to a square. Then that square was divided into four small squares. It was from one of those that this was folded. 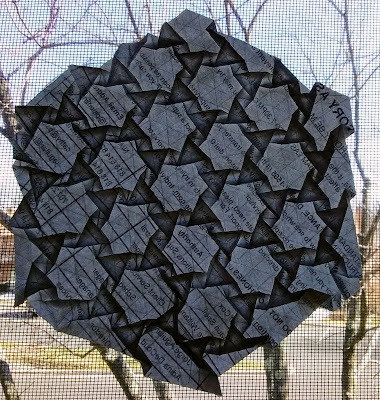 When I originally became interested in origami tessellations it was because of the spread hexagon tess. It intrigued me so much. I was determined to fold it myself. There were several failed attempts before I finally caught on to the rhythm its construction. 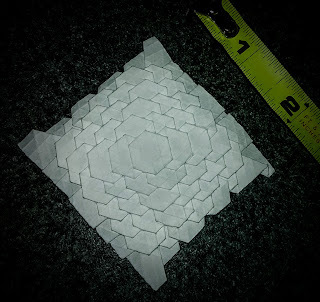 It was finally coming to understand that design that opened up the whole world of origami tessellations to me. Suddenly they all made sense. Or most of them anyway. It's a beautiful design that belies its underlying simplicity. What I love about it most is that it's a paradox. It's both complex and simple. That is, to me, the appeal of all origami. I folded a mini version of the spread hex tess just to see if I could. It was a fun exercise for my fingers and a bit of a strain on my eyes. 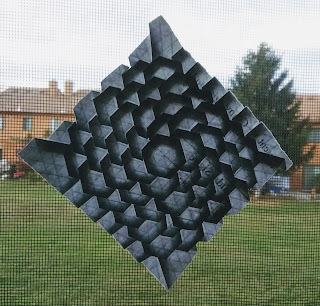 But mini tessellations are a unique challenge well worth exploring.